Spring is in the air at Cary Car Care! Or is that pollen? This time of year everything is yellow and when you can see the pollen on your car it’s a good time to think about the cabin filter in your car. Gesundheit! The cabin filter’s job is to improve the air quality inside your car by reducing dust, pollen & mold. Most manufacturers recommend a 15,000 mile service interval. Some recommend as much as 20,000 or 30,000 miles! Living in areas with heavy airborne contaminants, such as pollen, may require that your cabin filter get more frequent attention. We have changed a lot of cabin filters and believe that most would benefit from service once a year. 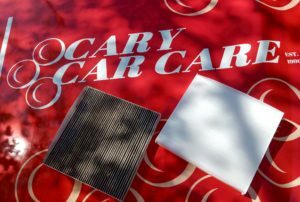 When should your cabin filter be replaced? Some signs that it is time to replace your cabin filter are increased noise from your interior fan or reduced air flow from your vents. Mildew or musty odors are another sign that your cabin filter may need attention. 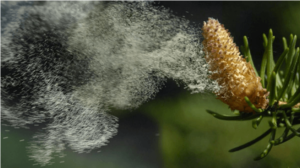 We can’t eliminate the pollen but we can help keep it out of your car! During your regular service visits at Cary Car Care, we will review your maintenance history. We will make the appropriate recommendation based on your driving habits and your cabin filter’s current condition. The Honda cabin filter on the left had 14,915 miles on it and was just over 2 years old next to the same part when new. All of the air coming out of your car vents goes through that filter! To learn more about what you can do to keep your vehicle in tip top shape, be aware of your car care needs in the Spring or contact Cary Car Care to schedule a visit and we’ll check the car out for you. Breathe happy and pollen-free! Keep those filters clean!